Missing cover art or show information for your movies you’ve backed up? 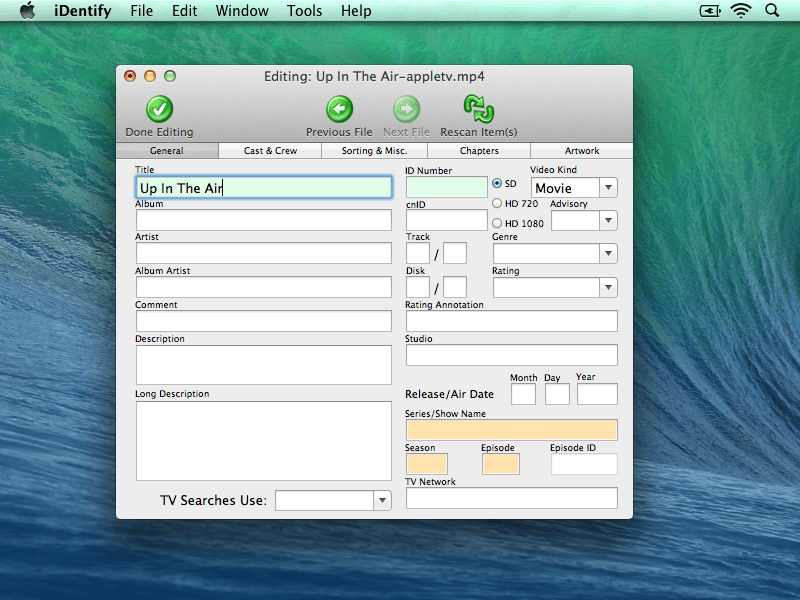 Looking to add program names to video files the easy way? 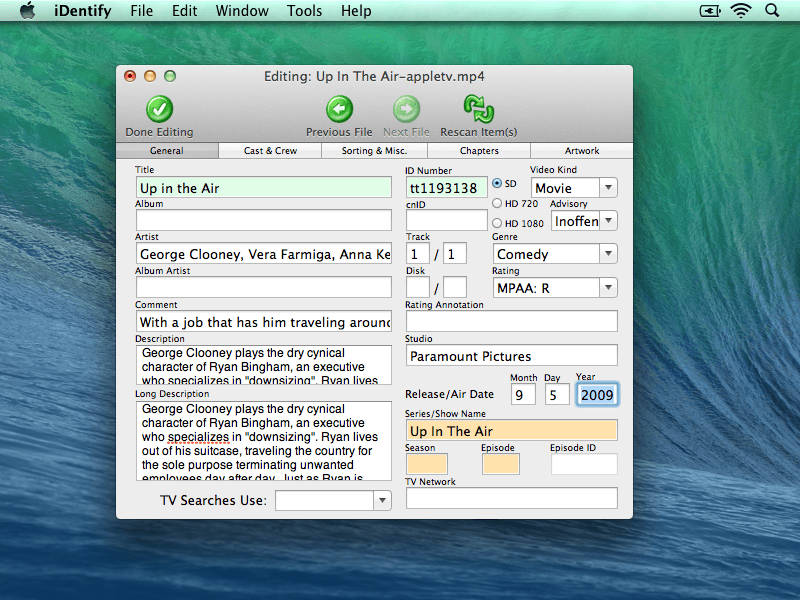 iDentify 2 for Mac looks at your file, goes off to IMDB, TVDB and others to populate that missing information and download cover art. It had driven me mad, missing cover art, manually editing video files to make sure they are all in the right season, running order and keeping things organised. On the PC there’s plenty of programs to do this but on the mac offerings are slim. Thankfully I stumbled upon iDentify 2. Pretty much as long as your video is in a .MP4 or MPV format then you are good to go. As iDentify 2 works with the file name it needs to be in a way that makes sense and correct which is no fault of the authors. For example American Dad is slightly different to American Dad! If a tv show or a movie has a “&” rather than “and” you’ll need to do some checking for the right name. Sometimes iDentify fails to do just that, find the name of the show or video but this is based on a number of factors but easily rectified. Up in the Sky first failed on the look up. All this took for a fix was a copy of the movie name into the series show name and grabbing the movie date from IMDB was all I needed to do. 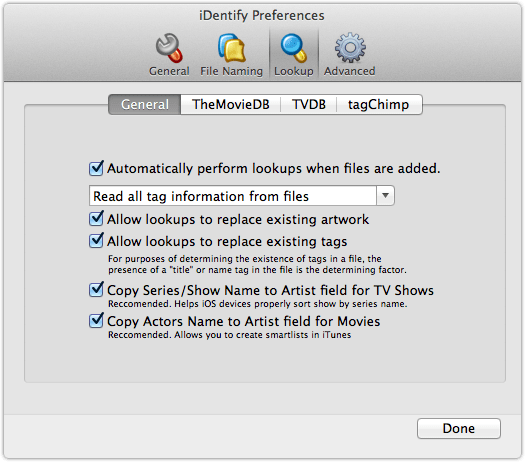 Most of the time you won’t even have to hit up IDMB or TVDB as it works more often than not. Hitting rescan filled in all the missing information. 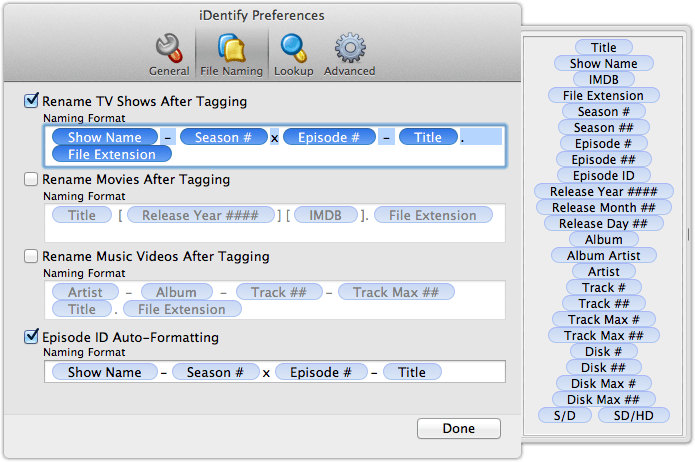 Options are tightly integrated into what the program is designed for but you can set up where you want to look for show information and setup how files are to be renamed. iDentify 2 is a god send for those with an unhealthy obsession like myself who need to see artwork and video information in their iTunes library. It doesn’t get any easy to use than this providing your files are in the right format to start with. iDentify 2 is available from the Mac App store and is priced £6.99. For the number of updates provided due to data providers changing their API’s it’s a worthwhile investment, if only to keep your iTunes organising OCD habits under control. To see what new features are coming soon check out the AMH Software site. Next Next post: iPad Air available at Tesco.